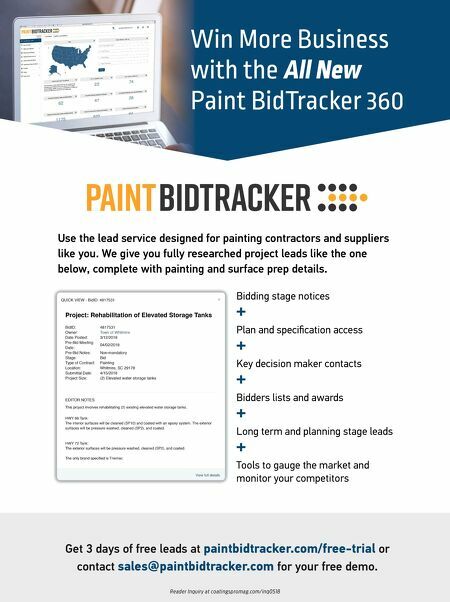 88 MAY 2018 COATINGSPROMAG.COM Notice: Publisher assumes no responsibilities for products or services herein advertised, or for claims or actions of advertisers. Any respondent unable to get satisfaction from an advertiser should promptly advise the publisher. Market Place The Best Value for Your Ad Place Your Ad in MarketPlace Now! Contact your Media Communications Specialist (281) 228-6446 SPECIALTY SURFACE PREP EQUIPMENT & SERVICES EMPLOYMENT Your MarketPlace Ad Here! Contact Your Media Communications Specialist Today (281) 228-6446 adsales@coatingspromag.com Your MarketPlace Ad Here! Contact Your Media Communications Specialist Today (281) 228-6446 adsales@coatingspromag.com Your MarketPlace Ad Here! Contact Your Media Communications Specialist Today (281) 228-6446 adsales@coatingspromag.com Place Your Ad in MarketPlace Now! Contact your Media Communications Specialist (281) 228-6446 sales@nace.org Place Your Ad in MarketPlace Now! Contact your Media Communications Specialist (281) 228-6446 sales@nace.org Place Your Ad in MarketPlace Now! 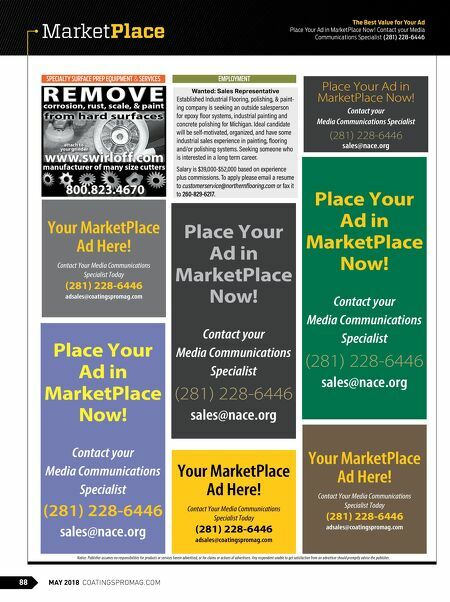 Contact your Media Communications Specialist (281) 228-6446 sales@nace.org Place Your Ad in MarketPlace Now! Contact your Media Communications Specialist (281) 228-6446 sales@nace.org Wanted: Sales Representative Established Industrial Flooring, polishing, & paint- ing company is seeking an outside salesperson for epoxy floor systems, industrial painting and concrete polishing for Michigan. Ideal candidate will be self-motivated, organized, and have some industrial sales experience in painting, flooring and/or polishing systems. Seeking someone who is interested in a long term career. Salary is $39,000-$52,000 based on experience plus commissions. To apply please email a resume to customerservice@northernflooring.com or fax it to 260-829-6217.